Time Trials Flight One: 1st Q7 Robbie Farr 11.721; 2nd V42 Jye O’Keeffe 11.955; 3rd W2 Kerry Madsen 12.044; 4th N99 Carson Macedo 12.191; 5th S27 Daniel Pestka 12.266; 6th S15 Aidan Hall 12.362; 7th S97 Matt Egel 12.386; 8th V60 Jordyn Charge 12.426; 9th W14 Jason Pryde 12.463; 10th Q59 Kevin Titman 12.467; 11th V68 Brett Milburn 12.524; 12th N56 Mick Saller 12,524; 13th S81 Luke Dillon 12.561; 14th N43 Alex Orr 12.571; 15th W80 James Inglis 12.592; 16th N47 Marcus Dumesny 12.854; 17th V22 Terry Rankin 12.884; 18th V17 Dennis Jones 12.887; 19th S4 Lisa Walker 13.098; 20th V45 Mike Van Bremen 13.110; 21st NT24 Jamie O’Neill 13.466; 22nd V7 Paul Solomon 13.688; 23rd V32 Stephen Spark 13.786; 24th V56 James Aranyosi 13.817; 25th N15 Matthew Thomas. Time Trials Flight Two: 1st V90 Corey McCullagh 12.374; 2nd T62 Tate Frost 12.523; 3rd V37 Grant Anderson 12.662; 4th V77 Brayden Parr 12.705; 5th NQ5 Danny Reidy 12.714; 6th USA71 Gio Scelzi 12.758; 7th S78 Keke Falland 12.858; 8th V55 Brooke Tatnell 12.940; 9th V58 Rhiannon Burleigh 13.041; 10th V98 Peter Doukas 13.056; 11th N48 Jackson Delamont 13.089; 12th V70 John Vogels 13.127; 13th NS4 Max Johnston 13.205; 14th N78 Andrew Wright 13.245; 15th N65 Brendan Rallings 13.248; 16th S24 Ricky Maiolo 13.300; 17th Q54 Randy Morgan 13.408; 18th N92 Sam Walsh 13.452; 19th W22 Brodie Minchin 13.596; 20th N27 Kyle Angel 13.658; 21st W97 Mitch Wormall 13.666; 22nd D3 Ben Atkinson 13.753; 23rd S96 Brendan Guerin 13,820; 24th VA92 Rob Trewartha 13.936; 25th D22 Leigh Mugavin 14.067. Heat One: 1st Q7 Robbie Farr; 2nd W2 Kerry Madsen; 3rd S27 Daniel Pestka; 4th S97 Matt Egel; 5th S81 Luke Dillon; 6th W14 Jason Pryde; 7th V22 Terry Rankin; 8th W80 James Inglis; 9th S4 Lisa Walker; 10th V68 Brett Milburn; 11th NT24 Jamie O’Neill; 12th V32 Stephen Spark; 13th N15 Matt Thomas. Heat Two: 1st N99 Carson Macedo; 2nd V42 Jye O’Keeffe; 3rd V60 Jordyn Charge; 4th S15 Aidan Hall; 5th Q59 Kevin Titman; 6th N47 Marcus Dumesny; 7th N56 Mick Saller; 8th V17 Dennis Jones; 9th N43 Alex Orr; 10th V45 Mike Van Bremen; 11th V56 James Aranyosi; 12th V7 Paul Solomon. Heat Three: 1st V37 Grant Anderson; 2nd S78 Keke Falland; 3rd NQ5 Danny Reidy; 4th V98 Peter Doukas; 5th V70 John Vogels; 6th W97 Mitch Wormall; 7th Q54 Randy Morgan; 8th N65 Brendan Rallings; 9th W22 Brodie Minchin; 10th S96 Brendan Guerin; 11th V90 Corey McCullagh; 12th V58 Rhiannon Burleigh; 13th D22 Leigh Mugavin. Heat Four: 1st V55 Brooke Tatnell; 2nd V77 Brayden Parr; 3rd NS4 Max Johnston; 4th N48 Jackson Delamont; 5th S24 Ricky Maiolo; 6th T62 Tate Frost; 7th N92 Sam Walsh; 8th N78 Andrew Wright; 9th VA92 Rob Trewartha; 10th N27 Kyle Angel; 11th D3 Ben Atkinson Jnr. ; DNQ USA71 Gio Scelzi. Heat Five: 1st S81 Luke Dillon; 2nd V22 Terry Rankin; 3rd N47 Marcus Dumesny; 4th V60 Jordyn Charge; 5th N99 Carson Macedo; 6th Q7 Robbie Farr; 7th V45 Mike Van Bremen; 8th W14 Jason Pryde; 9th S27 Daniel Pestka; 10th N56 Mick Saller; 11th V56 James Aranyosi; 12th N15 Matt Thomas; 13th NT24 Jamie O’Neill. Heat Six: 1st V7 Paul Solomon; 2nd W80 James Inglis; 3rd S97 Matt Egel; 4th V32 Stephen Spark; 5th V68 Brett Milburn; 6th W2 Kerry Madsen; 7th V17 Dennis Jones; 8th Q59 Kevin Titman; 9th S4 Lisa Walker; 10th S15 Aidan Hall; 11th V42 Jye O’Keeffe; 12th N43 Alex Orr. Heat Seven: 1st W97 Mitch Wormall; 2nd V55 Brooke Tatnell; 3rd V77 Brayden Parr; 4th NS4 Max Johnston; 5th NQ5 Danny Reidy; 6th S24 Ricky Maiolo; 7th Q54 Randy Morgan; 8th D22 Leigh Mugavin; 9th VA92 Rob Trewartha; 10th V98 Peter Doukas. Heat Eight: 1st USA71 Gio Scelzi; 2nd N92 Sam Walsh; 3rd N78 Andrew Wright; 4th N65 Brendan Rallings; 5th S78 Keke Falland; 6th S96 Brendan Guerin; 7th V37 Grant Anderson; 8th V70 John Vogels; 9th W22 Brodie Minchin; 10th N48 Jackson Delamont; 11th V2 Domain Ramsay; V89 Jamie Heyen. Sprintcar C-Main (12 Laps 4 Transfer to B-Main): 1st V32 Stephen Spark; 2nd V45 Mike Van Bremen; 3rd N43 Alex Orr; 4th VA92 Rob Trewartha; 5th S4 Lisa Walker; 6th W22 Brodie Minchin; 7th V56 James Aranyosi; 8th V58 Rhiannon Burleigh; 9th N27 Kyle Angel; 10th NT24 Jamie O’Neill; 11th D22 Leigh Mugavin; 12th N15 Matt Thomas. Sprintcar B-Main (20 Laps 4 Transfer to A-Main): 1st V42 Jye O’Keeffe; 2nd V70 John Vogels; 3rd Q59 Kevin Titman; 4th USA71 Gio Scelzi; 5th S15 Aidan Hall; 6th V7 Paul Solomon; 7th W14 Jason Pryde; 8th V17 Dennis Jones; 9th V98 Peter Doukas; 10th V68 Brett Milburn; 11th N48 Jackson Delamont; 12th Q54 Randy Morgan; 13th N43 Alex Orr; 14th V32 Stephen Spark; 15th N56 Mick Saller; 16th T62 Tate Frost; 17th V45 Mike Van Bremen; 18th S96 Brendan Guerin; 19th N65 Brendan Rallings; 20th VA92 Rob Trewartha. Sprintcar A-Main (30 laps No Time): 1st N99 Carson Macedo; 2nd S81 Luke Dillon; 3rd W2 Kerry Madsen; 4th V37 Grant Anderson; 5th Q7 Robbie Farr; 6th S97 Matt Egel; 7th S78 Keke Falland; 8th USA71 Gio Scelzi; 9th NQ5 Danny Reidy; 10th NS4 Max Johnston; 11th N47 Marcus Dumesny; 12th S27 Daniel Pestka; 13th V60 Jordyn Charge; 14th V55 Brooke Tatnell; 15th V22 Terry Rankin; 16th W97 Mitch Wormall; 17th S24 Ricky Maiolo; 18th N92 Sam Walsh; 19th N78 Andrew Wright; 20th V77 Brayden Parr; 21st V42 Jye O’Keeffe; 22nd Q59 Kevin Titman; 23rd W80 James Inglis; 24th V70 John Vogels. (Start Order: 1. N99; 2. V55; 3. Q7; 4. V77; 5. S97; 6. S78; 7. S81; 8. V37; 9. V60; 10. NQ5; 11. W2; 12. NS4; 13. N47; 14. W97; 15. V22; 16. N92; 17. W80; 18. N78; 19. S27; 20. S24; 21. V42; 22. V70; 23. Q59; 24. USA71. Lap Leaders: 1-15 V55 Brooke Tatnell; 16-30 N99 Carson Macedo. Heat One: 1st W98 Ewan McKenzie; 2nd W8 Jamie May; 3rd W55 Michael Coad. 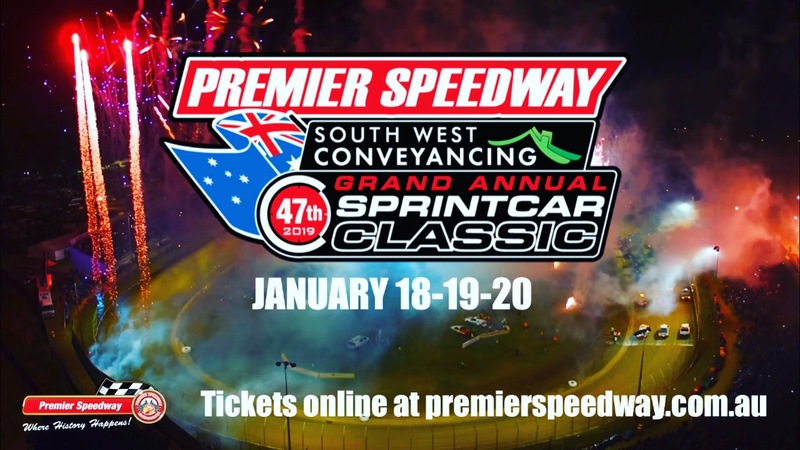 A-Main: 1st W21 Troy Gleeson; 2nd S26 Alex Bath; 3rd W84 Paul Verhoeven; 4th W98 Ewan McKenzie; 5th W55 Michael Coad; 6th W8 Jamie May; 7th M57 Troy Hose; 8th S59 Amy Duynhoven; 9th S53 Peter Duynhoven; 10th S66 George Woolstencroft.